Blackbeard himself can't get enough Pirate's Plunder! Spin to win as the Jolly Jackpot grows and grows. 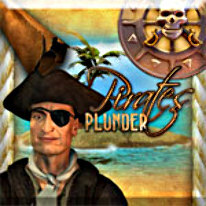 Double your plunder with Gamble or Roulette! Find the parrot and triple your payout. Unlock the treasure chests and win fabulous booty! Heh, booty... Set sail with Pirate's Plunder today!